1 What Is a Backpack Cooler Chair? The best kind of furniture serves multiple purposes. Thanks to modern technology and engineering we can make our chairs do a lot more than offering a place to sit on. Enter the types of backpack cooler chairs. These provide three different functionalities in one. Join us as we look at the different variations of this chair design, followed by a guide on how to find the best one for your needs. What Is a Backpack Cooler Chair? This unique type of chair combines several functions into one. The best backpack cooler chairs are relatively lightweight and fold into a backpack shape for easy portability. When deployed, they have soft coolers attached to the sides or back. These coolers are lined with foil for insulation, keeping the items inside cold for hours. Depending on the size of the cooler, you’ll have room for drinks and food. This unique combination of lightweight materials, design, and insulation makes for something you can take anywhere. 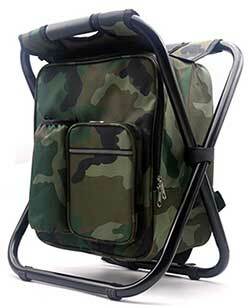 Backpack cooler chairs can be used for tailgating, hiking, camping, or even at the beach. The sheer versatility on display here makes this a remarkably unique chair. Let’s find out what types you’ll encounter. The concept of a backpack cooler chair remains the same across all the different versions. There are moderate changes to the size and shape of the cooler or coolers that come with them. Our first type is a simple and functional version of this concept. The cooler is attached to the seat of a small folding chair and occupies the space between the ground and the frame. The chair itself has a back and seat canvas but does not include any armrests or extra padding of any kind. You can’t beat the prices on these chairs; they are perhaps the least expensive version of a 3-in-1 backpack. This is the most versatile type of backpack cooler chair. It only weighs thirteen pounds and folds out to 20-inches in width. When folded, it becomes a backpack with adjustable straps that you can carry without any effort. The cooler is attached to the left arm and uses a cell foam insulation. It can hold up to 35 pounds of food or 24 12-ounce cans. The exterior of the cooler also has four smaller pockets for utensils or other items you need. On the opposite side of the chair, a fold out table extends out with a cupholder. Beneath this hands a two-tiered canvas shelf that can hold more items comfortably. Even though the chair doesn’t weigh much at all, it can support up to 350 pounds. At first glance, you could easily mistake one of these for a normal backpack. This type of folding chair backpack cleverly conceals the chair portion into the back of the design. 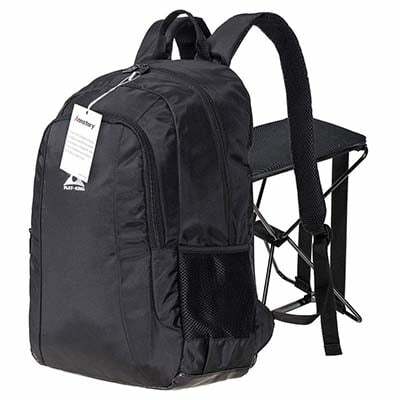 The backpack itself is large enough to hold plenty of items, even a laptop if needed. You can set the backpack down on the ground and pull out the chair. A few simple legs prop it up and allow you to sit at a moment’s notice. Backpack coolers can also double as a simple stool if they have a rounded top and a reinforced exterior. Many hunters use these kinds of backpack coolers because of their rugged design and camo exterior. The rounded top of the cooler makes for a perfect stool when you need to take a break for a quick drink or eat a snack. Camping chairs need to be sturdy to withstand the elements, which is why you need something comfortable and strong. 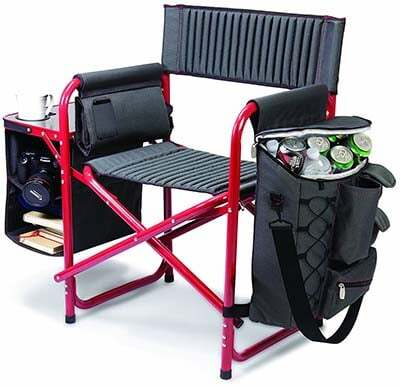 The best types of camping cooler chairs use an aluminum base with a mesh design for the seat and back. While you may not find a lot of features on these types of chairs, they will have a strong resistance to sunlight, freshwater, and saltwater. You’re paying for durability with this design. 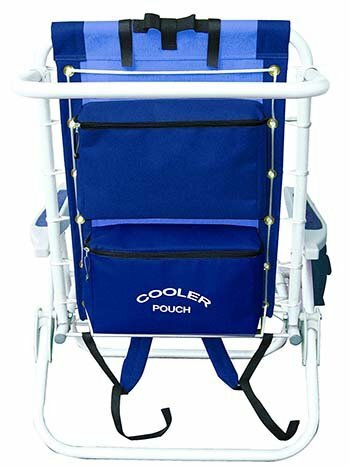 The cooler is attached to the back of the chair and hangs freely. It’s a simple, but effective design ideal for campers and lovers of the outdoors. Adjustable Straps - These types of backpacks tend to be a little larger than others, so look for an option to adjust straps for optimal comfort. Bonus points if you find an option with extra padding. Lightweight Design - You don’t want to strain your back, so check how much weight you’ll be carrying. Anything about 13 pounds will start to hurt after a while. Insulation - Some coolers have aluminum insulation, while others use a type of foam. Depending on which one is being used, the amount of time it can stay cold for will vary. Versatility - Does it work well with the rugged outdoors? What about a simple picnic? Consider where you’ll be using it before you make a decision. There’s no denying the sheer convenience that the types of backpack cooler chairs provide. The portability of a backpack combines with the storage of a cooler and the option to sit anywhere. It’s a great match for tailgating, the outdoors, or even the beach. Whether you want something simple and inexpensive, or a chair with all the bells and whistles, you’ll find what you’re looking for in one of these variations.